One can’t even sell you a bottle of his wine yet, and the other doesn’t have a winery, vineyards or retail store. But both Joe Di Profiio and Ilya Senchuk have similar dreams — to make top-notch wines from grapes grown in Niagara. They are two of Niagara’s newest entrants into the ever-expanding Ontario wine industry. He was a teacher, educator and administrator but when it came time to retire, Di Profio took inspiration from his son Fred, a winemaker in Niagara for Pondview winery in Niagara-on-the-Lake and now also at his dad’s winery, and bought a neglected vineyard, a gorgeous home that’s been converted into a bed and breakfast with help from his partner Carollynn Desjardins, and started the process of building a winery. 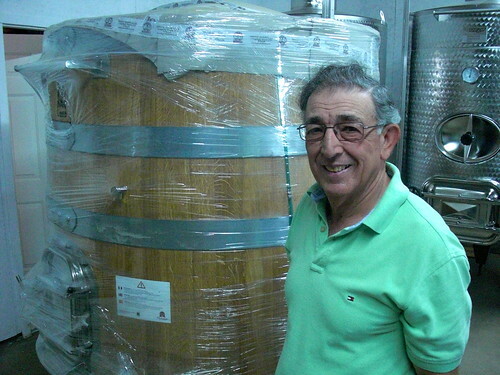 Joseph Di Profio with his new Italian fermenters. Neither Di Profio nor Desjardins knew how to even operate a tractor let alone go about the complicated business of acquiring the many licences you need to grow grapes, make wine and ultimately sell it at your site. And then there was the vineyard, 12 acres of vines that were in such poor shape they were advised to tear it all out and start over. “It was like a jungle,” says Di Profio on a recent visit to his Jordan Station home and site of the future winery. But he wasn’t about to start over. He replaced 4,300 plants, nurtured the other vines back to health and now has a viable crop of Cabernet Sauvignon, Gamay, Sauvignon Blanc, Vidal (all from the original plantings) and Riesling, Pinot Gris and Merlot (from the new plantings). The Gamay at Di Profio looks pretty good in the vineyard. Di Profio has made two wines from his first full vintage, a 2010 Vidal icewine and a 2010 Sauvignon Blanc, that are available now, with a 2010 Merlot and Cab Sauvingnon still in oak barrels waiting to be released early in the new year. 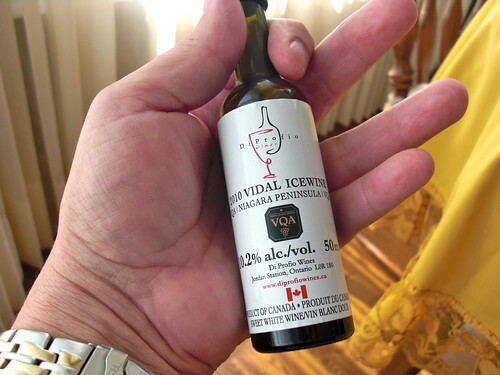 The 50 ml size Vidal icewine. The frustrating part for Di Profio is the fact that he can’t sell any wines at the moment from his home until he gets his winery built (he made the first vintage off site) and acquires the appropriate licences. He showed me the detailed plans for the winery and it will be a nice fit in the Jordan Station neighbourhood, and a short walk from Jordan Village and Cave Spring Cellars. Plans call for a view into the production area from the tasting room with a full gravity-fed winery to minimize damage to the grapes and provide a gentle approach to making wine. If approvals get done on schedule, the winery and tasting room should be open by next June. Di Profio’s plans are to produce only about 2,500 to 3,000 cases of wine per year. Modest by most standards, but pretty impressive considering Di Profio is in the midst of his retirement. Di Profio Wines Sauvignon Blanc 2010 ($17, 88 points) – A classic Sauvignon Blanc with fresh lime, grapefruit and tropical fruit notes with grassy-herbaceous nuances on the nose. In the mouth it’s bright and lively with zesty citrus, herbs, cut grass and an underlying spicy note from a touch of oak aging. Well balanced and not over done in any category. Di Profio Wines Vidal Icewine 2010 ($7 for 50 ml, 89 points) – An expressive nose of peach compote, apricot and sweet, wild honey. It’s very sweet and fleshy on the palate, partially balanced out by the acidity, with peach tart, apricot jam, marmalade and honey flavours. Ilya Senchuk, winemaker at Foreign Affair who, before that gig, was making Daniel Lenko’s wine, took a different approach to his dream of making his wines under his own label, Leaning Post Wines. Without a huge outlay of cash for a winery of his own, he decided to go the “virtual” route of making the wines of his choosing but using the facility of another winery to actually make the wine. In the meantime, he and his wife have just purchased an 11-acre property and home in Winona (across the street from Puddicombe Estate Farm and Winery) where they will begin replanting the former vineyard that consisted of Niagara, Concorde and Foch grape vines, next spring. Senchuk’s first two wines have just been released — a single vineyard Riesling from the Foxcroft Vineyard in Vineland and a Pinot Noir from the Lowrey family farm on the St. Davids Bench. Senchuk’s plan is to always have a good Pinot program for his virtual winery and loves the fruit from his friend Wes Lowrey’s vineyard. 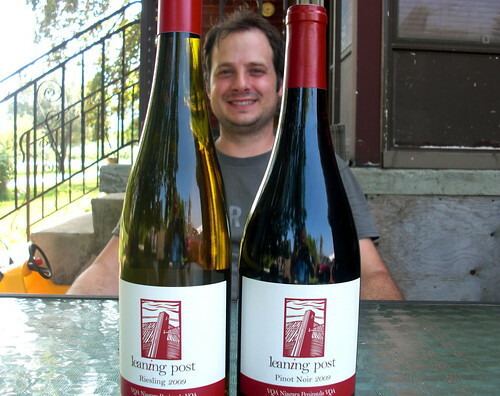 He’ll make another wine from the best of what the vintage has to offer, such as the Riesling he made in 2009. He’s planning another Pinot in 2010 as well as a Merlot. The winery will be very small production — the Riesling tops out at 94 cases with 145 cases of Pinot for the debut vintage. Both the wines list the greater Niagara Peninsula as the appellation on the label. Senchuk would have preferred to showcase the sub-appellation and vineyard on the label, but because it meant a lot more money to print different labels he decided against it for this vintage. With the Pinot and Riesling, it required a change of the black plate for the two wines, while an appellation change would have meant a colour plate change was needed at a far greater cost. To get the wines you can call Ilya (905-746-5206) or look for it on the wine lists of top Niagara restaurants (Treadwell Farm To Table Cuisine, for one) and in Toronto (including Canoe, Vertical, Ritz Carleton, Crush Wine Bar, The Spoke Club and Harbour 60). A website is coming soon. 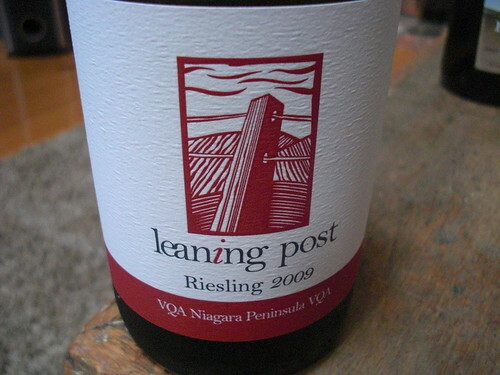 Leaning Post Riesling 2009 ($25, 92) – From the Foxcroft Vineyard, one of the top sites in Niagara for Riesling, and picked late at 22 brix but finished relatively dry. It’s my style of Riesling with sensational grapefruit, lemon-lime zest and flinty minerality on the nose. It’s loaded with citrus fruits, quince, some white peach and touch of ginger, focused minerality and razor sharp acidity that thoroughly cleanses the palate sip after sip. An age-worthy Riesling that left me to wonder what this would taste like side by side with 2027 Cellars Foxcroft Riesling 2009 made by Kevin Panagapka, another virtual winemaker. It would be a great study in terroir and what stylistic changes (later picking, leaving the juice on the lees, etc.) can do to alter a wine’s taste profile yet maintain similarities. 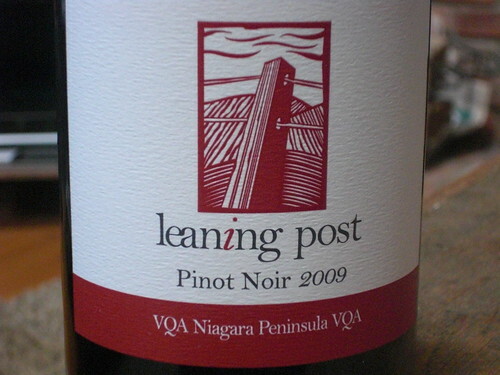 Leaning Post Pinot Noir 2009 ($38, 89 points) – A complex nose of cherry-raspberry, bramble, spice and a subtle savoury note in the background. It’s best to decant this St. Davids Bench Pinot for an hour or so as it’s quite tight and youthful both on the nose and palate. In the mouth, wonderful cranberry-cherry-raspberry and red currant fruits are joined by silky tannins, complex oak and spice notes and earth/loam/bramble undercurrents. There are a lot of parts at play here so I would tend to lay this down in the cellar for at least a year, maybe more, or enjoy now with food. Great first effort from Senchuk. Henry of Pelham Family Tree Red 2009 ($19, Vintages on Sept. 10, 88 points) — The Speck brothers are never content with the status quo. They are always building and tweaking their portfolio of wines while maintaining quality with the core brands. Sibling Rivalry was a successful second label for the Specks and now, with the release of a next-tier third label, Family Tree, they kick it up a notch or two. The red is a blend of Merlot, Syrah, Pinot Noir and Cabernet Franc. The nose is an intense mix of currants, pepper, campfire smoke, raspberry jam and savoury notes. The Syrah comes through loud and clear. It’s a personable wine in the mouth, and unique, with smoky, jammy fruits to go with earth, spice, vanilla, cracked pepper and firm tannins. A rustic, back-yard sipper for those who like a little oomph in their wines. Henry of Pelham Family Tree White 2009 ($18, Vintages Oct. 1, 87 points) — The white blend from this new label consists of Viognier, Chardonnay, Chardonnay Musque and Gewurztraminer. It has a floral nose with tropical fruits, peach and a bit of spice. It has lovely mouth feel with pear, melon, tropical fruits and vanilla-spice notes from barrel-aged Chardonnay and Viognier. Cattail Creek Cat-astrophe White 2008 ($14, LCBO, 86 points) — Cattail Creek’s answer to the “lifestyle” brand category made mainly for the LCBO. 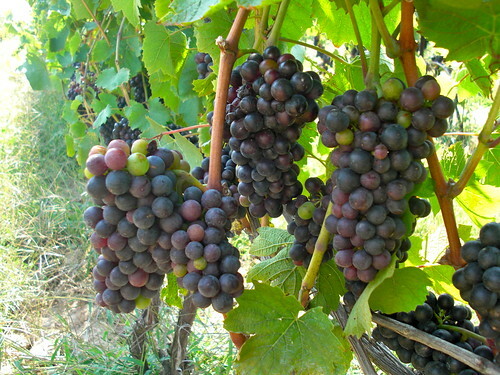 The white blend consists of Chardonnay Musque, Riesling and Gewurztraminer. The nose shows pineapple, peach and ripe citrus notes. It’s dry but fruity on the palate. A good sipping white. Cattail Creek also makes a sister Cat-astrophe Red, a blend of Gamay Noir, Merlot and Cabernet Franc.